synopsis of the manuscript and the first chapter (or the first 50 pages of the text). sinopsis del argumento y primer capítulo o primeras 50 páginas del texto. sinopsi de l'argument i primer capítol o primeres 50 pàgines del text. sinossi dell'argomento e primo capitolo o prime 50 pagine del testo. sinopse do manuscrito e o primeiro capítulo (ou as primeiras 50 páginas do texto). 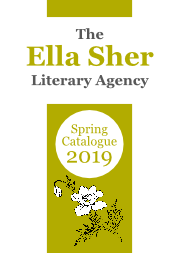 The Ella Sher Literary Agency manages foreign rights for international publishing houses and represents authors for all languages. The Ella Sher Literary Agency gestiona los derechos de traducción de editoriales internacionales y representa a autores para todos los idiomas del mundo. The Ella Sher Literary Agency gestiona els drets estrangers d'editorials internacionals i representa a autors per a tots els idiomes del món. The Ella Sher Literary Agency gestisce i diritti stranieri di case editrici internazionali e rappresenta autori in tutte le lingue del mondo. The Ella Sher Literary Agency faz a gestão dos direitos de tradução de editoras internacionais e representa autores para todos os idiomas. Follow us in Facebook, Twitter or LinkedIn. Siguenos en Facebook, Twitter o LinkedIn. Segueix-nos a Facebook, Twitter o LinkedIn. Seguici su Facebook, Twitter o LinkedIn. Siga-nos pelo Facebook, Twitter ou LinkedIn.